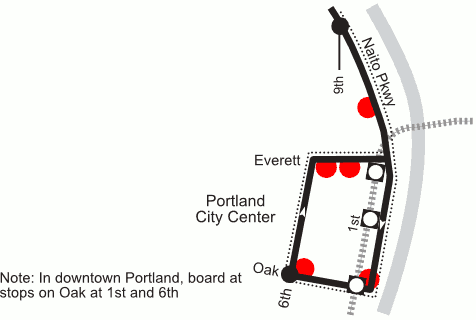 There should be a bus stop for TriMet Line 16 on Naito Parkway at the pedestrian bridge to Union Station. It would provide connections to Lines 9, 77 and ones on the mall. It would be especially useful if people see that a train is blocking the street ahead (the tracks cross just below the picture). Another good place to add a bus stop to Line 16 would be on Naito Pkwy (southbound) near Everett so that people headed east across the Steel Bridge don’t have to go around the full loop. 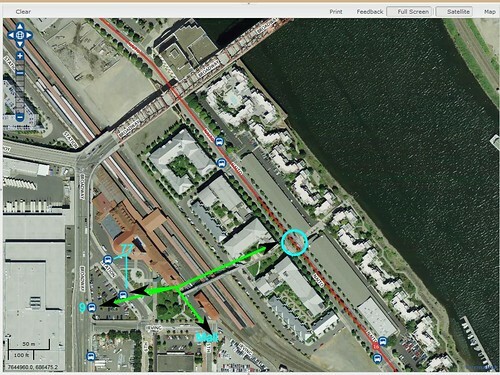 It would provide access to the Old Town/Chinatown MAX station with just a one-block walk. With the old mall, it turned here (originally at Couch) and provided this service.